Would you drive here in Wyoming? How accurate are GPS BLM/state land overlays? I see this often - a two track road on publice land cuts across a corner of private for a small distance, likely due to difficulty navigating terrain, and then back to public. Being in the surveying business, the intent of the road is to access this public property but due to rock outcrop, the only navigable way is to stay below the bench and cut across private land. Would you consider this trespassing and better yet, would a game warden view this as trespassing? yes unless the road is county. unfortunately. you would be better off going around. trespass tickets with intent to hunt are expensive. Beign in the survey business you should know the accuracies of a GIS maps. Intent doesn't matter trespassing is trespassing. Anytime I run into this and I really want to use it for access I do the leg work and research. Cheaper than a ticket. Not trespassing if the lo doesn't care. I crossed a bunch of those corners in Wyoming a few months ago. Depends. Some 2 tracks state they go through private and you must stay on them. If they are public 2 tracks then you are ok. If they are not posted, best to ask local game and fish. If I shoplift and am not caught, was it not shoplifting? If police do not care, am I good to go on pocketing a few items in the store? Wrong, the road doesn't have to be county, there just has to be an easement. Many BLM and FS roads cut through private property that have easements. In cases like this, how would you know if there is an easement in place? Contact the forest service or BLM office and ask them about the specific locations? Or are the easements shown on signs while driving down those two tracks? Yes, and Yes. I will say that in general, FS roads are more clearly identified as having easements than BLM roads. Another thing to do is to look at laws regarding easements in the State you're hunting. Yet another way to increase access to these two tracks is to support the Wyoming AccessYes program through a donation when you purchase your licenses. Thanks Buzz! 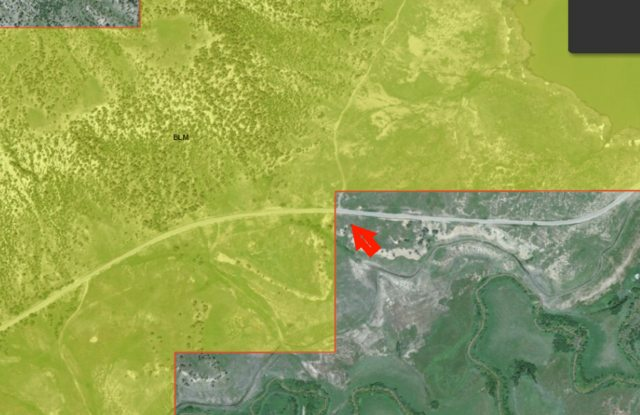 I have to admit that while I've certainly contributed to the Wyoming G&F through non resident license purchases ( between $400-$1,000 per year for 5 of the last 6 years), I haven't donated much to access YES and I know its a critical resource for WIA, HMA's and other important programs like these easements. What does everyone typically think is an appropriate amount to donate per year when purchasing a tag? I know that's subjective, but I could probably get my hunting group to donate when we purchase our tags, since I coordinate our trips and they pretty much follow my lead on how to handle things like this. Is $30 or 50 per person kind of in line with what would have a big impact. I've hunted antelope, elk and mule deer on HMA's or WIA's and they are certainly valuable resources t the hunting community. Contact the county road and bridge department, they will know if it is a county road with access through the private or call the landowner and ask if there is access across that corner. I think it's safe to say to donate what you can, nothing is too small. To put it in perspective, $1 roughly adds 3 acres of access, $5=16 acres and $10=32. AccessYes! is an amazing program, every donation adds access. If there's no easement all the OP has to do is call the land owner and get permission. In the case of your photo, it looks like the fence runs along the southwest side of the road. If this was a forest or BLM road, it wouldn't occur to me that there was an issue driving over this corner if there's no locked gate across the road. The best hunting area I have ever found was in Wyoming and had an easement to get through private property. It was dirty as hell! There was a sign that said the road was private and if you had maps stating that it was public the maps were wrong because the land had been sold. I went to the county and found the easement but it was not on that section of land. The easement for that road was actually recorded on an adjacent parcel of land. The land owner would stop you, yell at you, and threaten to call the Sheriff's Office. If you told him you knew about the easement he would claim the land was sold and there was no easement. If you produced a copy of the easement from the county...He would simply say "if you go a foot off the public, I will burn you down". It was a PIA but the best hunting I have ever seen. Every time I went out in the area I would see 180+ mule deer on a general unit. These types of places can be great but require research and tenacity. The problem was that the average person would never had known this was public and would never have gone there. I had to pry the information out of a game warden when asking how to access the land. When I inquired about a helicopter to get to this property is when he told me there was an easement but would not tell me anymore. He wanted me to research the property to get there. A NR would never have had the time to put in the work required top find this spot and that is why it was dirty as hell! I found a similar crossing in WY where the trailhead went about 50 yards onto private from the county road before entering a big chunk of BLM. Depending on which map and satellite layer view I looked at there was a lot of variation in where the road/trail was "supposed" to go and where it was in reality. I ended up emailing the game warden for the area and he confirmed that the trail was intended to allow access to the public BLM but that it was never moved fully over out of the private in order to limit environmental impact. When in doubt the game warden for that particular unit/area is going to be the best source of info. Ha. That's funny because I was in that unit this fall in that exact spot. I thought if I ever go back and if it's legal, I should carry a bike around that private and ride it on that trail since it opens up such a big chunk of public.